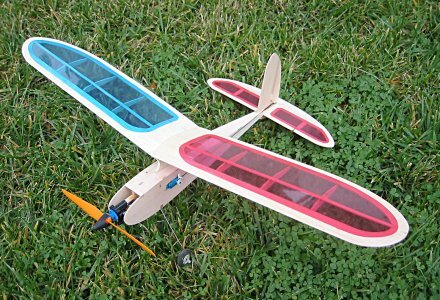 Built at under 3 ounces with standard, inexpensive parts this was an irresistable project for me. I really wanted something I could fly indoors, and this was my first serious effort. You can get yours cheap from Stevens Aero. All my training flights were outdoors. This particularly fun session took place at the nearby Rose Garden, where Bruce Jenner trained to win the Olympic Decathlon. The Diddlebug's aspirations are more modest. It is possible to fly it in the gym we occasionally get access to, but it is a bit of a challenge. But you never really learn how to build a plane on the first try, so I made Diddlebug Mark II specifically for indoor flying. Also to have cool colored wings. The Mark II Posing. Showoff. It is well named. It's cute as a bug and surprisingly fun to fly. The parasol wing is a little weak, though, and the first one was ripped to bits doing a dive into a loop. The outdoor model is beefed up a bit now (as a result of repairs). The motor is a GWS LPS "C" drive. Weirdly, this is the only plane I know of built to use that drive. I have put one in a Radical RC Micro Stick with poor results, and another in a Stevens Espresso, which is designed as an IPS direct drive pylon racer. 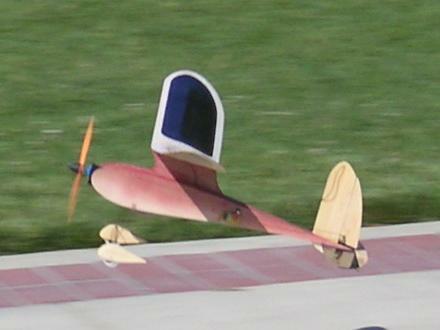 It flies wonderfully with the LPS "B" drive but the pitch speed is too slow with the "C."
Cool action shots by Akkana.